The Analyser Reference System type ARS contains the core of the well known and reliable analyzer (Ducati/Boconsult B10) for the measurement part, the standard impedance according to IEC/EN 60725 as well as a phase- and current range switching. All the required diagram connections for the two types of measurement are performed automatically by ARS without any manual operation: this increases the reliability of the measurement avoiding any possible wiring error of the operator and ensures fast and reasonable operation with the test system. 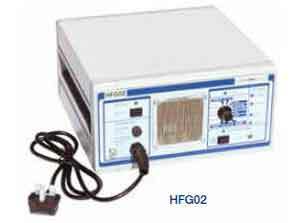 The Harmonics & Flicker Generator (HFG02) is a multifunction electronic load for the purpose of verifying harmonic and flicker test equipment. It provides an easy and reliable way to externally check the performance of the measurement system to the EN/IEC 61000-3-2 harmonics and interharmonics and EN/IEC 61000-3-3 flicker standards. A reference source is particularly useful where there is little intuitive sense of the expected response and the tests rely on software control and calculation to produce a result. The Harmonics & Flicker Generator (HFG01) has been designed by York EMC Services Ltd for the purpose of verifying harmonic and flicker test equipment. Until now there has been no easy and reliable way to externally check the performance of the measurement system to the EN/IEC 61000-3-2 harmonics and EN/IEC 61000-3-3 flicker standards. The HFG01 allows the user to periodically verify their test equipment, ensuring compliance with standards and laboratory quality procedures. The unit provides a series of harmonic and flicker disturbances of a nominal but stable level. The generator may therefore be used to verify the stability of a measurement system. Alternatively due to its stability it may be used as a transfer standard from a calibrated system. The unit is a standalone device and requires no additional equipment. A four-way rotary switch selects the mode of operation. The modes are defined by firmware running on a micro-controller. This will enable the characteristics of the generator to be reprogrammed in line with future changes to the standards. The HFG01 simulates equipment under test (EUT), generating known, repeatable levels of harmonic and flicker disturbance in one of four modes of operation. In Steady State harmonics (SS) mode, a harmonic-rich current waveform is generated, allowing the harmonic measurement system to be verified. In this mode the generator simulates Class D equipment and produces harmonic levels that will fail the EN/IEC61000-3-2 pre A14 and A14 Class D limits. This mode will pass EN/IEC61000-3-2 pre A14 and A14 Class A limits. Fluctuating harmonics (FL) mode alternates between two distinct current waveforms over a 10-second cycle. This mode again fails the EN/IEC61000-3-2 pre A14 Class D limits but passes the A14 limits. In flicker test mode, a fixed level of mains disturbance is generated at a rate of 8.33Hz or 1Hz. When tested to EN/IEC61000-3-3, the 8.33Hz rate produces a Pst >1, which lies above the limit line. The 1Hz setting produces a Pst <1, which falls below the same limit. The AC2000A is a fast, easy to use mains and harmonics analyzer with full graphical display. It is capable of continuous real-time analysis of both voltage and current. 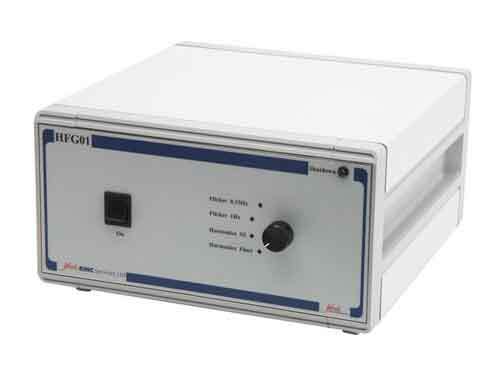 As a general purpose mains analyzer it can measure Watts, VA Vrms, Vpk, Arms, Apk, Crest factors, THD, Power factor, Frequency and Inrush current.As a harmonics analyzer it is a quick and convenient instrument for pre-compliance measurements using normal mains supply and is capable of full compliance measurements to EN61000-3-2 in conjunction with a suitable power source.As an option, the AC2000 can be operated as a conformance quality flicker meter in conformance with EN60868 and EN61000-3-3. 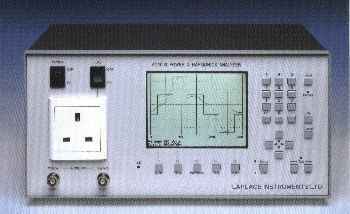 Measurement Circuit: Single Phase with standard mains connector. Current Rating: 16A rms continuous, or national connector rating if lower. Voltage Ranges: 115V (±200V pk) 230V (±400V pk). Frequency Range: 45 - 66 Hz. Sampling Rate: 300 points per cycle. Measured Parameters: Vrms, Vpk, Arms, Apk, Crest factors, THD, W, VA, Power factor, Frequency, Inrush current. Measurements: 1 st harmonic to 40 th harmonic. Basic Accuracy: Better than 5% of limit or 0.2% of selected range whichever is the greater. Display Modes: Numeric readout of parameters. Graphical Waveform display with accumulate and max. Hold facilities and class D mask. Tabular and Histogram harmonic analysis with comparison to limits in the standards. Measurement: P st and P lt to EN60686 and EN61000-3-3. Display: 320 x 240 pixel backlit LCD. 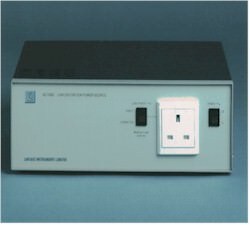 Interfaces: Parallel Printer, RS232, Optional IEEE-488 (GPIB). Instrument Supply: 230V or 115V ±14%, 48 to 65 Hz. Operating Range: +5°C to 40°C, 20-80% RH. 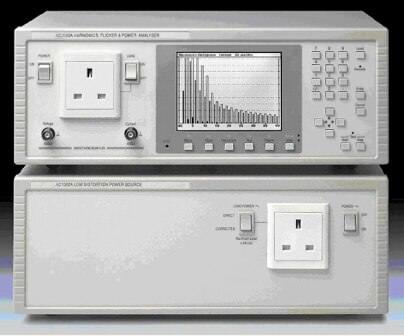 The AC1000A is an innovative, low cost, pure power source designed specifically for use with a harmonics analyzer such as the Laplace AC2000A, permitting compliance quality measurements to EN61000-3-2. The AC supply available at a standard wall socket is usually distorted. This comes about because of nonlinear loads (non-resistive loads) on the AC supply such as transformers, fluorescent lights, switched-mode power supplies etc. In a typical load there are rectifiers and capacitors that cause current to be drawn from the supply only near the peak of the waveform. The effect of this is to flatten off the top of the sine wave causing significant distortion. In a typical factory environment this distortion can be so significant that the distortion is easily visible using an oscilloscope. EMC legislation (EN61000-3-2) has made mandatory the measurement of harmonic current produced by electronic equipment, and requires that the source supply provides a pure voltage waveform to the equipment under test. The harmonic currents can vary significantly when a pure source is used so it is important that any testing is performed with a device such as the AC1000. Compact and portable the AC1000 is rated up to 1000 V.A for 230 V operation and will supply 1000 V.A at 230 V input at up to 35°C ambient. In contrast to other techniques which use a passive filtering approach, the AC1000 uses an innovative technique which actively corrects the AC supply to produce a harmonically pure output. 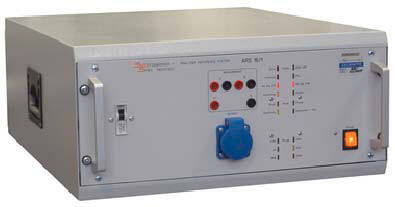 The ACl000 is also very useful for stress testing power supplies in electronic equipment. The use of a harmonically pure, distortion free device - such as the ACl000A - is essential to fully stress and evaluate the power supply under test. Output Voltage: Tracks the amplitude of the fundamental of the input voltage. A variable voltage input may be used to adjust the output voltage to within the limits specified by EN61000-3-2. Output Distortion: Dependent on the purity of the input but will generally meet the requirements of EN61000-3-2. Output Current: Maximum continuous output current is 4.4A. Output Connection: U.K., Schuko, or other national outlet sockets. Load power switch can be set to direct or corrected for ‘A—B’ comparisons. Protection: Thermal trip automatically diverts load to a ‘direct’ connection in the event of thermal overload. Operating Range: 5°C to 35°C at full rated output. Environmental: Indoor use at altitudes to 2000m, Pollution Degree 2.